Why Does Goldfish Water Turn Cloudy? Goldfish are fun to observe, inexpensive to purchase, and don't take up a lot of space. No wonder they're such a popular pet choice for kids and first-time fish owners of all ages. But what to do if you wake up one morning and find that your goldfish water's gone cloudy? Try not to panic! There are things you can do to clear things right up. What Color is the Cloudiness? The color of the water will help you assess the source of the cloudiness. If green, you've probably got an algae issue. If white (like frosted glass), then you're probably dealing with bacterial bloom. If yellow or gray, then you've most likely got a plain old dirty tank. The Nest provides the following remedies for each of these problems. Add some algae-eating fish or snails to the tank. Scrape off the algae with an algae scraper, and use algaecide chemicals. Ensure that the tank is not kept in direct sunlight. If these don't resolve the issue, add a UV light. If bacteria is the culprit, you might need to purchase a broad-spectrum antibiotic like minocycline. Go to your nearest pet store (where there is a fish specialist) to find the product that's right for your particular situation. Be patient after administering the antibiotic as it can sometimes take weeks for the water to clear. If the tank is dirty, clean out the filter and do a partial water change. Water clarifiers like polyelectrolytes and chlorohydrate may also be required. Clarifiers work by gathering up and binding small particles within the water (from uneaten food, fish waste products, etc. 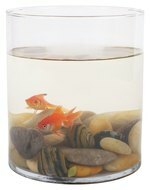 ), allowing them to sink to the bottom of the tank or get sucked up through the filter. 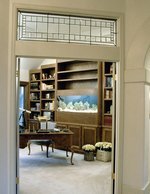 You'll also need to perform partial water changes on a regular basis in order to keep the tank clear. Your water change schedule will depend upon variables like the size of your tank, the number and type of fish you have, and how well your particular filter performs. If you're a new goldfish owner, you may be overzealous feeder. Excess, uneaten food can cloud the tank as well as provide fodder for bacteria. Also, goldfish don't have stomachs, so the food they eat passes through them very quickly! With this in mind, it's generally recommended that you feed your goldfish a few small meals per day, rather than dumping in a lot of food at one time. This article is meant to be a simple guide to help you quickly figure out what the problem might be and to give you an idea about how you might solve it. Please do some targeted research before performing any of the steps mentioned above.